Skipper Greer, age 66, died Wednesday night January 4, 2012 at 10:50 pm Pacific, due to complications arising from brain surgery. Skipper was born and raised in tiny Grandfield, Oklahoma. After attending Oklahoma State he moved to Los Angeles. He acted in films alongside talents like Raquel Welch. His love of the movie business and Hollywood glamour enabled him to segue effortlessly into behind-the-scenes roles, including working directly for a number of famous actors and a long stint at Disney. More importantly, he was charming, sweet, funny, sincere, and caring. The impact he had on my father's life is impossible to articulate. 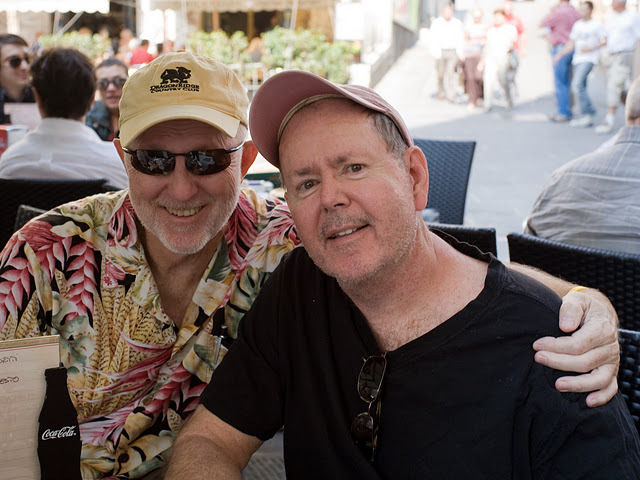 I am grateful for the chance to have known him. To remember and honor Skipper, my father has established a scholarship at the Massachusetts Institute of Technology named the Skipper Greer and Joseph L. Kirk ('64) Scholarship Fund. In lieu of flowers or other remembrances, you can make a tax-deductible contribution to the fund. Checks should be made out to Massachusetts Institute of Technology, including a designation to deposit it into fund account #347-4500. All contributions will be matched by my father or me. I listen to a lot of quiet instrumental music these days. I call it ambient, because it's too dark and interesting for "new age". I started and ended most of my days in 2011 with one or more of these records, and worked and traveled to them as well. Tim Hecker "Ravedeath, 1972" and "Dropped Pianos"
Masterful work from Mr. Hecker, who keeps sharpening and improving his palette. "Dropped Pianos" are the quiet piano demos for the massive, delicate album "Ravedeath, 1972", which is all pipe organs, processing, and pianos. A quiet album that sounds even better loud! "Cendre", the previous collaboration between guitar processor Christian Fennesz and pianist Ryuichi Sakamoto, is currently in a "cooling-off period" because I overplayed it. This double CD will, for better or for worse, end up in the same place eventually! Harold Budd "In The Mist"
Harold Budd and Robin Guthrie "Bordeaux"
Harold Budd, John Foxx, and Ruben Garcia "Nighthawks"
Harold Budd, Robin Guthrie, and Eraldo Bernocci "Winter Garden"
Harold Budd supposedly "retired" in 2004, but has produced more music since retirement than he did in the decades prior. It may be kinda samey, but it sure is nice. "In The Mist" is actually divided into 3 different sections. The first is reminiscent of his masterpiece collaborations with Brian Eno, but the rest of the disc is equally as strong in its own way. "Bordeaux" is a collaboration with guitarist Robin Guthrie in the vein of their previous works. It is distinguished by a brighter mood, slightly faster tempos, and a bit more melancholy than mystery. "Nighthawks" features John Foxx (who created one of my favorite rock albums this year) and Ruben Garcia with a series of piano pieces. Only available with Budd and Foxx's previous collaborations "Translucence" and "Drift Music" (previous favorites). "Sad piano music", as my friend Lauren would say. 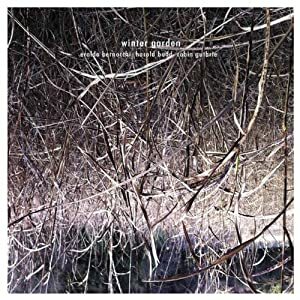 "Winter Garden" just came out, and it's lovely. A bit more modern and fresh than any of the others on the list. Complex and rich. My current favorite. Live electric guitar improvisation. But it's not wheedle-wheedle noodling, it's processed, pitch-shifted, looping, droning, soaring tones. The last track is called "The Return of the Sky Whales". Perfect.